This cocktail is not only a 1st Place winner in 2016's Rose Julep Competition, but it's also the perfect winter warmer for a frosty day. Place 7-8 mint leaves in the bottom of the silver julep cup and press lightly with a muddler to release the oils. In a mixing glass combine all other ingredients(except cayenne and mint sprig) with cracked ice. 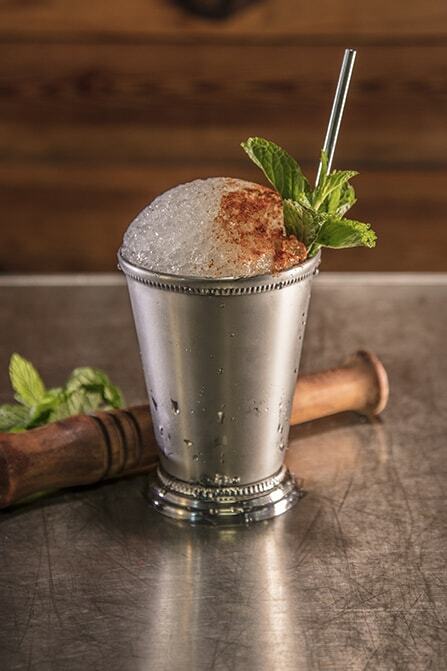 Stir to combine ingredients and add dilution, and add crushed ice to the mint julep cup nearly to the top. Pour ingredients from the mixing glass through a hawthorn strainer over the ice in the julep cup, and top the julep cup with a dome of crushed ice. Smack the mint sprig between the palms of your hands to release oils and aromatics, and place in the ice directly across from where the straw will be placed. Place the dried chili on top of the drink tucked nicely next to the mint bouquet.